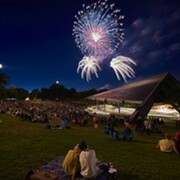 If only the weather looked like this outside Severance Hall Sunday afternoon. The lights dim, the second half has arrived. We're here for this, we've been waiting. The melody starts so simple and quiet, but as with all variations on a theme, it doesn't stay that way. 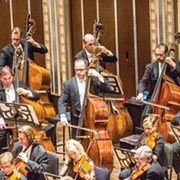 In the Cleveland Orchestra's capable hands this Sunday afternoon at Severance Hall, Edward Elgar's "Enigma Variations" is a wonder to behold. Guest conductor Vladimir Ashkenazy aptly moves the entire orchestra through the calm and also wildness of the 30-minute spectacle. When the famed "Nimrod" variation (although not as famous as Elgar's "Pomp and Circumstance") comes in the middle of the work, it's like he's painting a sunrise with his baton. The horns bring a majesty, the basses a depth, the timpani a power. You think anything is possible. Throughout, the viola, cello and clarinet solos are especially glorious, and when the final variation, the composer's musical self-portrait, rolls to a close, the audience is pulled to its feet in awe. My seat partner even comments the work felt short. In other words, it flew by in the best of ways. But that's just the ending. The Cleveland Orchestra, recently back from a European tour, begins Sunday's matinee performance with Edward Elgar's "Serenade for Strings." Its eleven minutes has a calming effect on the packed-in crowd, at some points even a little bit of a sleepy effect. It feels like a warm up. A note about arriving late: The Cleveland Orchestra keeps good on its promise to start on time. It you are one of the unfortunate souls who arrives just a minute after the theater doors have closed, you won’t be able to get into your seats until after the first piece is performed. Finding (free) parking around Severance Hall can be somewhat of a challenge, especially on dark, gray Sundays in November. Plan accordingly. Stagehands roll a piano to the front of the stage for the conclusion of the first half. And out comes our soloist for the day, Emanuel Ax. He looks unassuming in a regular suit, nothing sparkly or dramatic as we see with so many other soloists. The pared down orchestra starts in on Beethoven's "Piano Concerto No. 1" as Ax sits and waits for his moment. As with many concertos, there's not a whole lot of excitement for the orchestra, but once Ax gets to the keys, everything else falls away. This is an artist who doesn't expel any extra energy with head waves or large arm flourishes (truly a refreshing sight). He sticks to the keyboard, and he plays it effortlessly. It's in the soft moments that he shines, when he's showing us his insides. A note about cell phones: Good to know if your cell phone goes off, an usher won’t tackle you to the ground. But to whomever’s phone started ringing near the end of Ax's concerto performance? Not cool. Ashkenazy keeps the whole piece together well. It's always a bit unclear how easy a conductor is to follow from a musician's perspective, but from the audience's side, he is a joy to watch, while still making the concerto about the soloist. In the end, as we make our way out of the concert, reality hits. We learn of the harrowing Texas shootings. It begins to rain. Puddles fill the streets. Mud cakes the bottom of our shoes. Drivers don't stop at crosswalks. The world seems to fall apart. 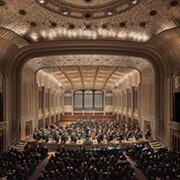 But just a while ago in Severance Hall, music was the unifier. For a couple of hours this afternoon, there was goodness. And that can't be taken away.